Squingy.net | Pontificating the superfluous. 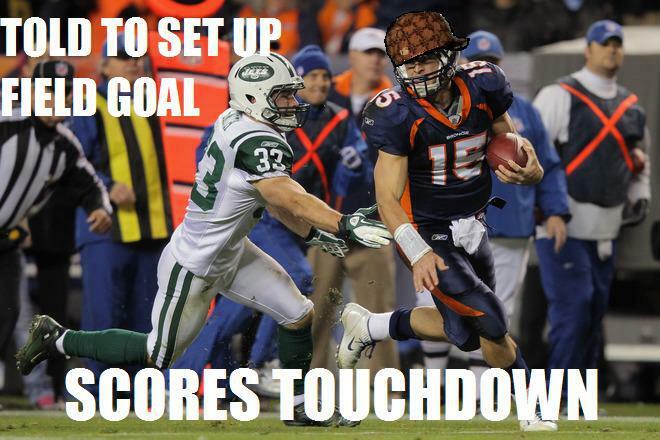 Scumbag Tim Tebow if you need him. I’m still not really sure that I saw what I just saw. The Denver Broncos are down 13-10 to the New York Jets with the ball on their own 5 yard line and about five minutes to play. Surely, the worst case scenario for the Jets is overtime, right? Well, the sports world wouldn’t be in hysterics if that had happened. Instead of overtime, the legend of Tim Tebow claimed yet another victim. On the last drive of the game, which started on Denver’s own 4 yard line, Tebow passed for 35 yards and ran for another 57 and the game winning touchdown on a 20 yard scramble. The Broncos are now 5-5 on the season, including 4-1 since Tebow became the starter (3 of those are come from behind wins), and are in the thick of things in the AFC West playoff picture. This is the first time I’ve gotten a chance to see Tim Tebow in action since he was drafted, and it wasn’t a disappointment. This is the type of performance that people remember, and I know I certainly will. Had everyone else in the house not been in bed, I would have started yelling TTTTTIIIIIIIMMMMMMM TTTTTTEEEEBBBBBBOOOOOOWWWWWWW at the TV. I was also really impressed with NFL Network’s handling of Tim Tebow. They were reasonable, informative, and certainly were not vitriolic like ESPN’s analysts are. In fact, I’d venture so far as to say that Merril Hoge choked on a chicken bone when Tebow scampered in for that touchdown. Heimlich! If you keep up with sports at all, you’re going to be deluged with Tim Tebow and all kinds of adjectives to describe him as you watch/read/listen to sports news tomorrow, so I’ll just summarize my thoughts succinctly: that last drive was really cool to watch. Just what is lolcongress getting into lately? They should know better. Really, they should. We didn’t elect them to declare what type of food pizza is. And did they stop to consider that pizza sauce is made from the tomato, which is a fruit? 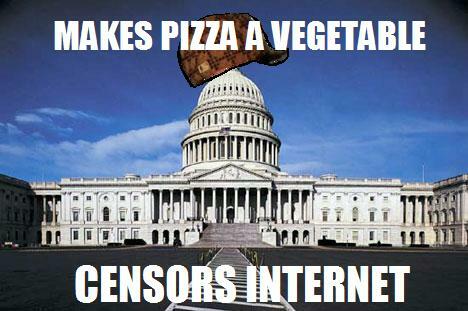 And we don’t need them to censor the Internet. Yes, I am against piracy, but the level of censorship they’re suggesting is dangerous and (dare I say it?) Orwellian. Hopefully it won’t pass. Coaching finally a reality for Mark Jackson. Though he has no prior coaching experience, Mark Jackson has popped up on several occasions over the past few seasons as teams have looked to fill a vacancy on the bench. Now, it’s finally happening. The Golden State Warriors, who went 36-46 this past season, have named Jackson their head coach and signed him to a three year, $6 contract. This comes a couple weeks after the team introduced Jerry West as a front office executive; West previously worked in the front office with the L.A. Lakers and Memphis Grizzlies. It will be interesting to see how Jackson fairs in his first season as a head coach. He sits 3rd all-time on the NBA’s career assist list, so it seems reasonable that he would have a good understanding of the game. Whether he can actually coach and teach his players is yet to be seen. Hopefully he won’t talk to his players like he does people tuning into NBA games on ABC or ESPN, where he spews out cliches and catch phrases such as: Grown man move! Momma, there goes that man! Hand down, man down! Now if someone would just hire Jeff Van Gundy I could watch games in peace, but is there any team that desperate? Warriors hire Jackson as new coach. in "The Game of Basketball"
Lakers lose in spectacular fashion. 2004- they lost in the NBA Finals 4-1 to the Detroit Pistons. 2006- they lost in the first round of the playoffs to the Phoenix Suns after having a 3-1 series lead. 2007- Phoenix knocked them out again with a 4-1 first round win. 2008- the Lakers make it to the Finals to face the Boston Celtics, but lose in Game 4 after having a 24 point lead and then got blown out in Game 6 131-92. You can add yesterday’s display to this list, after the Dallas Mavericks completed their second round sweep of the two-time defending champs with a 122-86 shelling. And really, it’s not just yesterday’s display that will be remembered. The entire series, the Lakers did not look like they were into it as they failed to close out games and allowed the Mavs to do whatever they wanted. Pau Gasol was so out of it that he might as well have been on the disabled list due to a removed spine. The bottom line is, the Lakers quit. The Mavericks were definitely on fire the entire game, but the Lakers had lost that game by halftime when they were down 63-39. I would have expected them to come out after the half and play like they did when they won the last two NBA championships. You can come back from 24 points in a half and win a game. It’s entirely possible, but not if you quit, which is why the lead was 36 when the game ended. I would have expected Kobe Bryant to come out of the locker room like a bat out of hell, but he finished the game with a pedestrian 17 points and I can hardly remember seeing play in the 2nd half. It was amazing to see the Mavericks tossing in three-pointers from all over the place; for my part, I’ve never seen anything like that happen. They tied the NBA playoff record for threes in a game with 20, hit 63% of their three point attempts, and shot 60% overall from the field. And to add to the fun, most of that came from the bench. Peja Stojakovich scored 21 points on 6-6 shooting from behind the line (7-7 overall). It seems like it’s been years since he’s played as well as he did during the series. J.J. Barea, all six feet of him, scored 22 points on 9-14 shooting. And finally, Jason Terry played like an “on fire” Reggie Miller in NBA Hangtime, draining threes from all over the place. He finished the game with 32 points on 9-10 shooting from behind the arc (11-14 overall). Dirk Nowitzki was the only starter to score in double digits with 17 points, but when the bench by itself scores as many points as the other team, it doesn’t matter too much what the starters do. In fact, things were going so well for the Mavs that the record tying three was hit by Brian Cardinal. Andrew Bynum is still a loser. Bush league is right, Mike Tirico. Not only was that elbow a dirty play, but Bynum did it against someone a foot shorter and 110 pounds lighter. And Barea still hit the shot. Lamar Odom was also ejected for a hard and unnecessary foul against Dirk Nowitzki. Odom’s take on the series was especially pathetic. A Tale of Two Flops. You will never see a worse flop as long as you live, unless you watch wrestling or soccer (as the next example will demonstrate). Earlier this season Oklahoma City’s Kevin Durant called Bosh a “fake tough guy,” which made Bosh, the rest of the Miami team, and their supporters all indignant. “Durant’s just upset he lost,” they all said. And now he does this. Is there a worse way to make people think that you’re not a fake tough guy? If I wanted to make people think I was tough, I wouldn’t do this. I also wouldn’t keep getting punked by the Boston Celtics, but that’s another story. Predictably, he’s been shredded on the Internet; “Bosh Spice” was a trending topic on Twitter. While Bosh’s flop was pathetic and sissy, this one is just stupid. Actually, it’s laughable. In fact, I think I’ve seen this shtick before in episodes of The Three Stooges. And what’s even more outrageous is that it worked! No one saw this? The camera saw it, of course, but they don’t use instant replay in soccer, so what good does that do anybody? Bosh’s flop makes me seethe with anger because it’s people like him that make the NBA unbearable to watch, but this one just makes me laugh. Pro-soccer honks keep harping about how “beautiful” a sport soccer is (and it is if you’re watching the World Cup), but for every amazing goal there’s an equally egregious flop. Could it be that soccer is the Chris Bosh of professional sports? Could you have made the Carmelo trade? All rhyming aside, I don’t know if I could have pulled the trigger on this trade. Every trade in every sport has the risk/reward element attached to it, but there was a lot to weigh in New York’s pursuit of Carmelo Anthony. On the one hand, Carmelo is a superstar in the NBA and, you could argue, the best pure scorer the league has. Compare him to some of the other big scorers. He can shoot from the perimeter better than LeBron James and he’s a better post player than both James and Kevin Durant. There just aren’t that many players around with his skill set, and if you have the opportunity to get a player of his ilk to pair with someone like Amar’e Stoudemire, you have to make it happen. On the other hand, just look at who all they gave up. And not only that, consider how young these guys are. Point guard Raymond Felton, forwards Danilo Galinari and Wilson Chandler, and center Timofey Mozgov. Any team would be glad to add them to the roster and they are all 26 years old and younger, so there’s room for them to get better. Galinari and Chandler have improved every year while Felton is putting up career highs in points (17) and assists (9). Mozgov is still just a rookie, but he’s shown promise. So what do you do? We know what the Knicks and Nuggets did, but I’m not sure I would have the guts to pull that trade if I’m the Knicks. Sure, if I’m the Nuggets I do it in a heartbeat because there’s no way Carmelo was coming back next year. When faced with a scenario like that, you make sure absolutely you don’t become the next Cleveland Cavaliers or Toronto Raptors. I think everybody would take the deal they got for him. You’d have to be pretty dumb to pass up the package they got from the Knicks. But if I’m the Knicks? It’s hard to trade that much youth and potential, regardless of who you’re getting. I think both teams came out looking pretty good in this trade. The Knicks got their second superstar in Carmelo and also got one of the better point guards in the league in Chauncey Billups, the afterthought of this trade. For the Nuggets, they’ve got a good core of young players to rebuild around if they want it. The problem, though, is that none of them are superstars. They played off of Stoudemire very well in New York, but now in Denver they won’t enjoy the same open jump shots that he provided them. It’s going to be interesting to see how both of these teams do for the remainder of this season, as well as in the future. Cleveland’s not looking so hot. This is a good example of why you shouldn’t write things when you’re mad. After LeBron James famously left Cleveland for Miami during his ridiculous free-agency, Cavs owner Dan Gilbert fired off this angry letter. I’m sure it probably felt good at the time, but it was about as thoughtful as LeBron’s absurd “The Decision” infomercial. Fast forward to tonight, and the Cavaliers are a miserable 8-44 and just set the NBA record for consecutive losses at 25 with a 99-96 loss to the Dallas Mavericks. It’s hard to fathom a team being so bad. All they lost was one player and they’ve been set back 10 years after being contenders. For his own sake, I wish Dan Gilbert had waited to issue that kind of a statement. Had he thought about it for the night, he might have come up with something better than the above quote. In fact, he probably could have gone the entire letter without using the caps lock. He could have inspired his team and the city of Cleveland. He could have handled the situation with grace and come out of it looking pretty good compared to LeBron. Instead, he sunk to LeBron’s level, wrote an angry letter, and now finds himself in charge of one of the worst teams in NBA history. So kids, don’t write while mad.